11.00am – Family Service - Dedication of prayer books given in memory of Anne O’Halloran by Mothers’ Union. ‘Mums in NovemberCoffee by MU in aid of projects home and abroad. 7.30pm - Badminton Club New members welcome.. 18yrs and older. 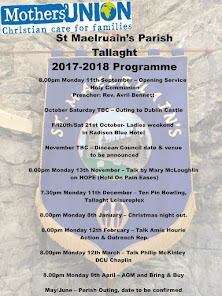 Contact parish office for more details. 8.00pm - Safeguarding trust refresher for workers and panel members in Newcastle Parish Centre, Co. Dublin. 7.30 – Bowls Club meets at parish centre - New members welcome. 8.00pm - Bible Study of the reading for the following Sunday, upstairs Parish Hall. Please note new day and time. 6.45pm - Girl’s Brigade – New members please contact parish office or rector..
8.00pm - Select Vestry meeting in the Long Room of the Parish Centre. 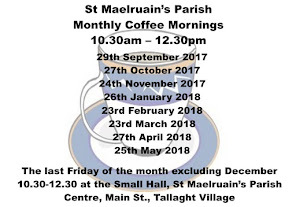 10.30am – 12.00 pm Parish Coffee morning in the small hall, all welcome. 2.00pm - Christmas Craft Fair in Rathfarnham Parish Centre 2pm – 5pm. 2.00pm - People’s Climate Change March meeting at Custom House Quay. 3.00pm - Girls Brigade past members Advent Carol Service Kill O Grange. 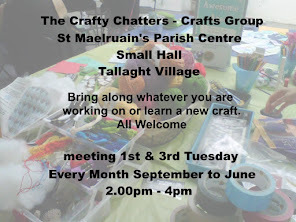 2.00pm The Crafty Chatters meet at the small hall. 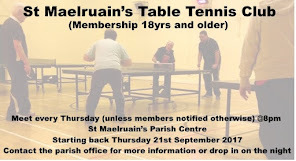 New members welcome. Now meeting 1st and 3rd Tuesday of the month 2pm-4pm September - June. Bring along whatever craft you are working on. 8.00pm - Bible Study of the reading for the following Sunday, upstairs Parish Hall. Please note new day and time, moved from Thurs afternoons. 1st Wednesday of the month Holy Communion with laying on of hands for the sick. 12.00pm - Parish School Christmas Fair and raffle. 8.00pm - Music Group Practice, singers and musicians welcome. We sing Carols and Christmas songs, we have a Gift stall, a raffle and have refreshments of wine, tea, coffee and mince pies. Please do what you can to help, buy / sell raffle tickets, donations of wine, mince pies and donations to the gift stall would be greatly appreciated. 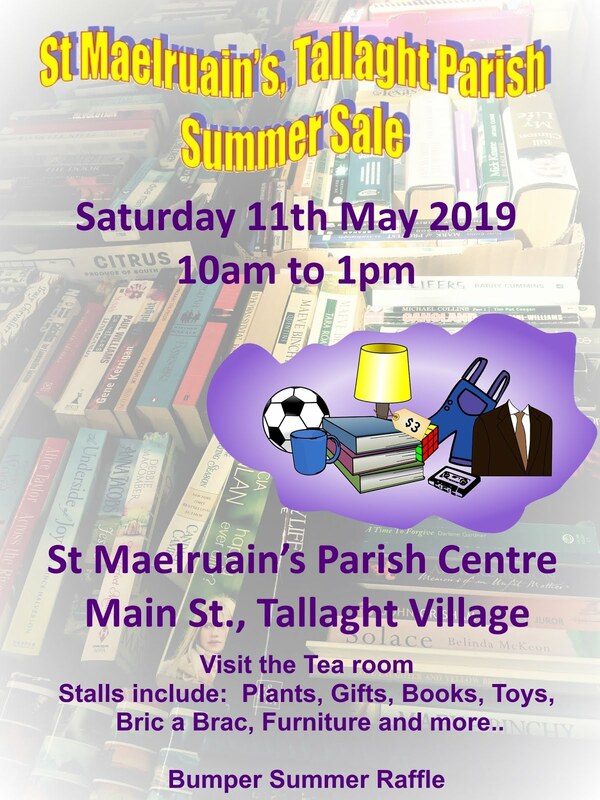 Please phone Ronnie Scott 086 804 5090 for more information. 7.30pm - Mothers Union fellowship dinner in the Springfield Hotel, Leixlip.